“To anyone who has worked with them, tektites are probably the most frustrating stones ever found on earth.” – Henry Faul, 1966. Faul’s description of tektites still holds true even today. While more data has been collected and theories on the origin of tektites have been reduced, these small, glassy objects still provide many questions for current tektite researchers. Let us begin our discussion with a brief history lesson. The name tektite is derived from the Greek tektos, or melted. These glassy objects have fascinated people of the world for centuries. The first known description of tektites comes from China around 900 B.C., during the T’ang dynasty, in a book by Liu Sun, Ling Piao Lu Yi, loosely translated as “Notes on the Wonders Beyond the Nanling Mountains in Kwangtung”. Liu Sun stated that lei-gong-mo, or inkstones of the Thundergods, black stones that made a ringing sound when struck and possessed a brilliant luster, were collected after rainstorms. Barnes (1973) Until the late 19th and early 20th century, tektites remained an enigma. Little research was conducted until Alfred Lacroix, a researcher from the Musee National d’Histoire Naturelle, Paris, described a large tektite deposit in Indonesia, and later identified the Ivory Coast as another tektite locality. Barnes (1973) These discoveries, and the subsequent publishing of the research about them sparked the interest of other scientists throughout the world. The remaining first-half of the 20th century was spent locating and identifying additional tektites and their localities across the globe. 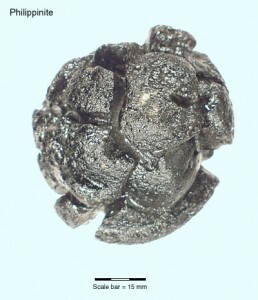 As more and more tektite localities were found, many different hypotheses were developed to explain the unique chemical and physical properties of tektites. During the 1950’s and 60’s, tektite research came to the forefront because of the belief that they might have originated from the Moon. This theory was later discounted by most scientists, but the vast body of information collected during this period provided the basis for the tektite research that still continues today. 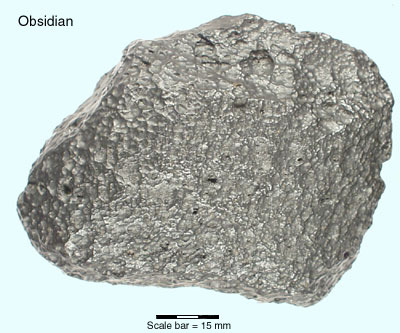 Tektites are rounded, pitted bodies of silicate glass, nonvolcanic in origin, most likely derived by large hypervelocity meteorite collisions with terrestrial rocks. 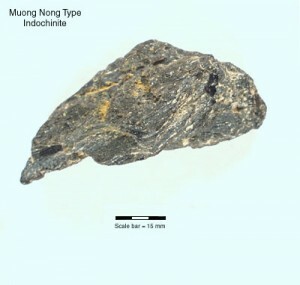 Commonly about the size of a walnut, tektites can vary from sand grain sized microtektites, weighing grams, to large, blocky, Muong Nong-type specimens weighing up to 12.8 kg (28 pounds). Tektites can differ in both color and age, depending on where they are found. Commonly black color, tektites can also vary from light green to greenish yellow. Ages vary from ~35.5 million to ~750,000 years old. 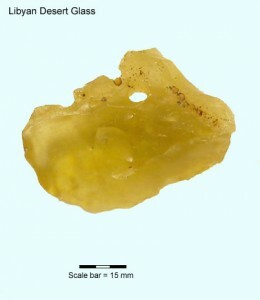 Chemically, tektites are uniquely characterized by extremely high silica contents ranging from ~70% in Australasian tektites to ~98% in Libyan Desert Glass. See some examples from the NPL collections. Most current scientists theorize that tektites are formed by the rapid heating and subsequent cooling of quartz-rich soils and rocks. The impact of large meteorites with the surface of the Earth provides enough energy to melt soils and rocks and disperse the molten ejecta of these impacts great distances, forming tektites. Mixtures of shale and quartz sandstone or certain igneous rocks, possess similar compositions to that of the tektites, leading researchers to believe that these rocks may be the “parent” or “source” rock of tektites. Additionally, terrestrial soils, which cover almost the entire globe, have been found to also possess the proper chemical compositions, to create tektites. Produced by the erosion of many different source rocks, these soils would be a potential source of tektite-melt material. Before we begin discussing in depth the process of tektite formation, perhaps we should consider why the meteorite impact theory has gained favor with modern-day researchers. With tektites closely resembling obsidian, many early researchers believed that they were indeed products of terrestrial volcanic eruptions. Their various shapes were theorized to result from abrasion by wind-blown sand or shaping by water. Chemical properties and the subsequent determination that tektite surfaces were ablated NOT abraded, later disproved this theory. At first glance, abrasion can look similar to ablation. Here’s how they differ: Abrasion is the mechanical wearing or grinding away of rock surfaces by the friction and impact of rock particles transported by wind, ice, waves, running water, or gravity. Ablation is the removal and reshaping of molten surface layers of meteorites and tektites by vaporization during flight through the Earth’s atmosphere. (definitions from Bates and Jackson (1984)). Obsidian is found in nature as a black glass, a product of the ash trapped within the crystal, the presence of the green and yellowish-green moldavites and Libyan Glass, as seen below, provides an easy example of why this theory can be discounted. The suggestion that tektites were actually man-made objects, created during the smelting process of ancient civilizations. The idea that natural fires such as forest fires or ground fires igniting coal seams could be a source of tektites. Although these fires may reach very high temperatures, the presence of ablation shapes and other unique chemical properties in tektites discounted this theory. Another proposed alternative for tektite formation was the fusing of silica-rich surface soil and dust by lightning. These forms, called fulgurites, while having attained high enough temperatures to have melted the silica, do not have the same appearance as tektites, often occurring as soda-straw shaped tubes, as seen here, and possess none of the unique chemical and physical properties that set tektites apart from other naturally occurring glasses. In addition, the nature and scale of tektite occurrence discounts this theory as well. Lightning strikes occur thousands of times each day. If this theory held true, tektites would be found throughout the world, in great abundance. 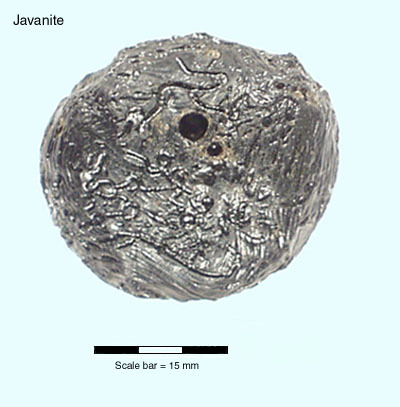 Theories suggesting that tektites were material ejected from lunar volcanoes or that tektites were formed by the impact of meteorites with the Moon gained wide acceptance during the 1950’s and 60’s. However, some scientists doubted these theories, suggesting that tektites were actually formed on Earth by meteorite and/or comet impacts. After the Apollo Moon landings scientists studied and compared the chemical composition of lunar rocks to tektites. Their conclusions showed that there was little to no similarity between tektites and lunar materials, shedding doubt on the lunar origin of tektites, and adding credit to the terrestrial impact theory that is now widely accepted. •	Distribution and geological age. •	Physical properties and chemical compositions. •	Shape and melting features of some specimens. Tektites are distributed across the Earth in areas called strewnfields. These strewnfields are found on every continent except Antarctica. Each strewn-field is comprised of specimens similar in age and chemical compositions, including tektites found on land, as well as microtektites, found in deep sea sediments, and are inferred to have been created by an impact event of the same age. 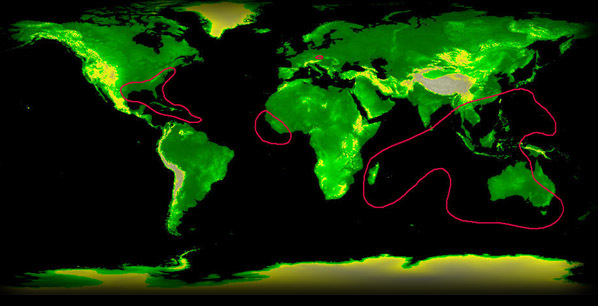 The main strewnfields found on Earth are the Australasian, the largest of all of the strewnfields, covering an estimated 10% of the Earth’s surface, the Ivory Coast, Czechoslovakian, and North American strewnfield. See images of possible tektite source craters. Individual tektite varieties are given distinctive names; derived from the region of their strewnfield occurrence, and/or the place or country in which they are found. Examples of regional nomenclature include “moldavites”, named for the Moldau River in the Czech Republic, and “bediasites”, named for the Bedias Indians, for those found in Texas. Others, named after the region or country in which they are found, include australites, javanites, indochinites, and philippinites. A few groups, such as the Ivory Coast tektites and Georgia tektites, are not specifically named. The ages of tektites are derived by several means. The first and most direct way of dating a tektite is by measuring the solidification age of the glass through the use of 87Rb/87Sr decay measurements. The age of ablation caused by atmospheric entry or re-entry can be derived by potassium-argon decay measurements. Fission track analysis, another geochronolgic tool, can indicate the latest heating episode of the tektite glass. Finally, the stratigraphic age of sediments surrounding tektites can provide a general time frame of formation and/or deposition of the tektites. Tektites range in age from 35.5 million to 750,000 years old. Using these dates scientists have tried to correlate the ages of tektite strewnfields with impact craters across the globe. For the most part, these researchers have been successful in determining the source craters for tektites, however, the source crater for the Australasian strewnfield, still has not been found, allowing some people to still question the meteorite impact theory. Physical properties and chemical composition set tektites apart from other naturally occurring glasses. Normally the first thing mentioned about tektites is their color. Outwardly, tektites appear to be glossy-black, but thin sections of specimens are translucent, and generally appear to be yellowish brown. The black color of most tektites can vary, however, depending on the strewnfield the tektite is located in. 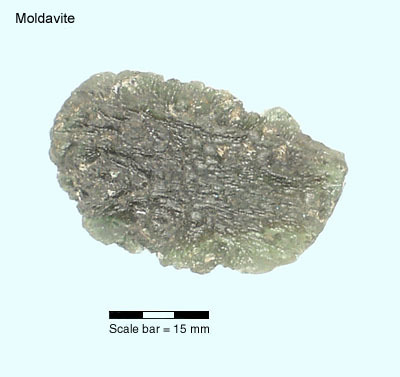 Moldavites are dark green and Libyan Desert glass is greenish-yellow to straw yellow in color. Tektites possess a hardness of between 6 and 7 on the Mohs’ scale, a geologists’ scale that ranges from as soft as talc (1) to as hard as diamonds (10). Silica is the most common chemical constituent of tektites. Silica content, is often measured by using two physical characteristics, refractive index and specific gravity. The refractive index of a material indicates how strongly it deflects light passing through it. Specific gravity indicates a material’s density. Specific gravity and refractive index show an inverse relationship to silica content; that is, the higher the refractive index and specific gravity, the lower the silica. Percent silica composition ranges from around 68% in Ivory Coast tektites and Philippinites to around 98% in Libyan Desert glass. It is believed that variations in the silica content of tektites is due to the silica content of the parent rocks. It must be noted that some types of obsidian also possesses high silica contents, up to ~80%, however, there are several other features of tektites that set them apart from other forms of naturally occurring glasses. Often included within tektites are tiny particles of lechatelierite, a very rare, fused silica glass, formed by the melting of quartz crystals by extremely high temperatures and pressures. 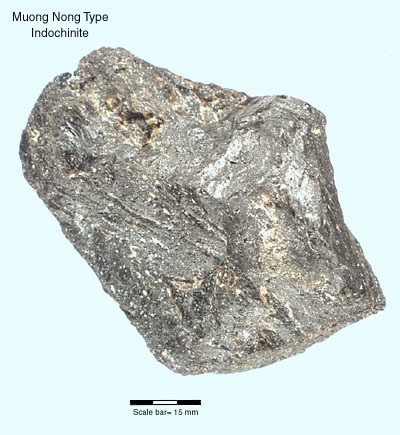 When associated with tektites, this material is normally used as evidence for shock metamorphism, caused by a meteorite impact event. The presence of these particles is important because obsidian and other volcanic glasses do not contain these particles. Air bubbles are often associated with lechatelierite. These associated bubbles are indicative of the temperature at which the lechatelierite formed. Other bubbles, not related to lechatelierite particles, are also found in tektites. These bubbles are formed by gases that were trapped while the tektite material was molten. Variations in abundance, shape and gas content of these bubbles can tell us about the conditions present during tektite formation. However, these bubbles can also lead to errors in specific gravity measurements. Therefore, refractive index is normally seen as the most accurate way to measure silica content. In addition to their distribution, age, and physical and chemical properties, tektites may be subdivided into three distinct types on the basis of their external form. Also known as the Muong Nong-type, these tektites are often chunky or platy in external form, but often show evidence of internal compositional layering as well as variations in bubble content. Believed to be formed by puddles of molten glass, this tektite type was discovered in 1935 by Lacroix, they are named for the town of Muong Nong, Laos, located near where they were first found. Or “splash-form” tektites, consisting of specimens, when unbroken, can be shaped as spheres, ellipsoids, rods, teardrops, dumbbells, and boats. Some of these tektites show contoured, bent and rolled internal structures due to fluid flow while molten. The shapes of splash-form tektites have previously been erroneously associated with aerodynamic shaping. In actuality, these tektites were shaped by variations in rotation rates of partially melted glass droplets. With dumbbell shaped specimens showing the highest rates of rotation and spheroid specimens exhibiting little to no rotation. The size of these “splash-form” tektites is limited by the surface tension of the melt from which they are formed. These tektites are type B forms that have been subjected to attack by heat on one side (Called the anterior side), so that a portion of the mass has been lost to ablation and/or has been resculpted to form a flange derived from the anterior side’s material. Often known as flanged “buttons”, these forms are most common in Australites, but are also found in some Javanites.